Adam's Beach House @ Princes Grant - Prince's Grant Accommodation. Prince's Grant Golf Club and Country Estate is situated on the Dolphin Coast (North Coast) KwaZulu-Natal, 40 minutes north of Durban/Umhlanga, within easy reach of the Northern KwaZulu-Natal game reserves and battlefields sites. With panoramic views of the Indian Ocean, this development was designed to capture the gracious colonial life-style of early Natal. Designed by Matkovich & Hayes, the course is ranked 21st in the country and presents challenges similar to those of traditional links course in Scotland, and the unsheltered fairways mounds and well shaped bunkers are reminiscent of the fabled links courses of Great Britain. 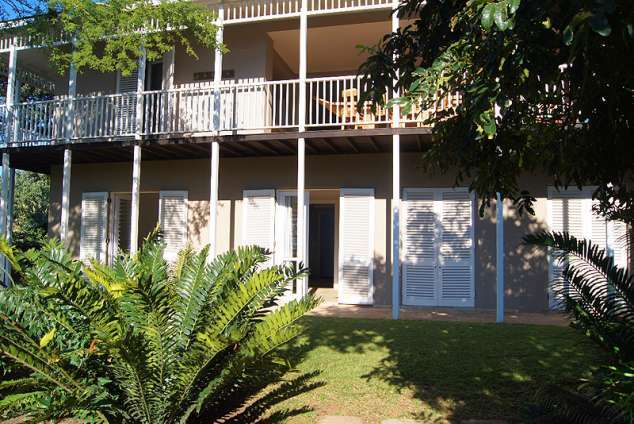 This home is privately positioned overlooking an indigenous garden and the ocean for you to enjoy the tranquillity only interrupted by the numerous birdlife whilst lazing on the verandah or cooling off in the swimming pool. The comforts of home beckon with its large open plan living areas, spacious and comfortable lounge and 2 en-suite bedrooms upstairs. Downstairs there are another 4 bedrooms, 1 is en suite and there are 2 communal bathrooms for the other rooms. 6 bedrooms with fans of which 3 are en-suite, accommodating 12 people privately on king size beds. Downstairs TV Lounge, plasma screen, overhead fans. Upstairs TV Lounge: 2nd Channel Digital Satellite, overhead fans. Large open plan dining room (seats 12) and kitchen with breakfast counter (seats 6). Fully equipped kitchen and scullery including 2 fridges, gas stove plus electric oven, microwave, dishwasher, clothes washer and tumble dryer. Two sets of linen, beach and bath towels. A bar with 6 seats and an outside fridge for drinks. There is a dormitory room with 3/4 bunk beds, sleeps 10- we don't want more than 12 in our home at a time but will consider it if there is a golf tour and will charge accordingly. Communal swimming pool. Kids play area with jungle gym and trampoline. Braai area. Squash courts. The new Umhlanga Gateway Shopping & Entertainment Experience, The Lifestyle Centre at Ballito all within 40mins. Day trips to Mkuze, Umfolosi and Phinda. Lake St Lucia's world heritage site and Maputaland marine reserve all within 3 hours. uShaka, the world's 5th largest marine park in Durban's new Point Waterfront 1 hours drive. Ulundi Battle Ground and other famous battlefields. Experience a Zulu wedding or a Sangoma's initiation, or take a drive through Shakaland to experience true Zulu tradition and culture. 3938 page views since 25 Jul, 2016. Last updated on 27 Aug, 2018.